Looking for an effective whitening soap? Here’s one that works rather well to lighten even stubborn intimate areas — Triple Whitening Soap. 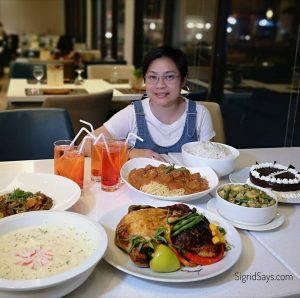 It can also give you an opportunity to earn some extra income on the side. Dark underarms bothering you? Let it go and enjoy your summer outfits with Triple Whitening Soap. 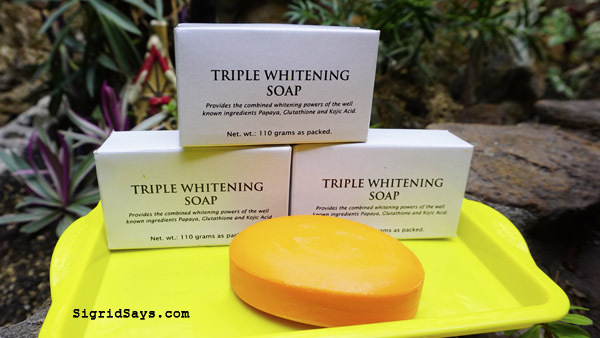 The Triple Whitening Soap is a whitening bar soap that uses three active ingredients known to effectively whiten the skin. 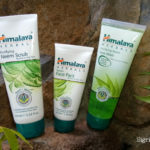 It is proven safe and effective for use on the entire body, including the face, just like you would your regular soaps. It may be used on naturally dark skin or those that have been darkened because of sun exposure. Yeah, while the sun can stimulate the production of Vitamin D in the body, it can really darken our skin. It is just advised to use the product in a different manner on the face and on the body. But aside from being effective, the Bacolod City distributor of the Triple Whitening Soap is giving a business opportunity to anyone who wants to share this effective product to others. 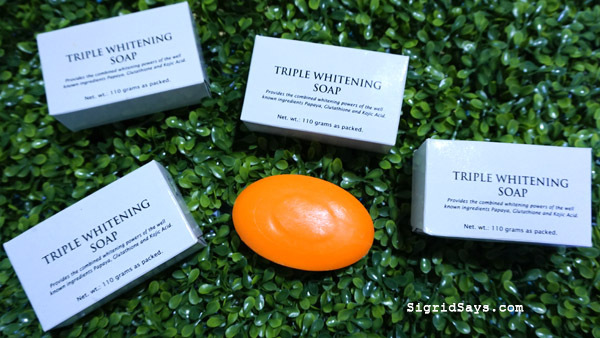 Many Filipinos men and women would like to lighten their dark skin, and the Triple Whitening Soap could help in that aspect, as it gently but effectively works. I would advise you, however, that if you are using any whitening product, you have to apply sunscreen during the day, as sun exposure can hurt your lightened skin. However, if you don’t want to lighten your naturally beautiful brown complexion, this soap can be used in dark intimate areas that have been bothering you, like the underarms, the inside of the thighs, bottom, and even the knees and elbows. These areas are prone to be darker than most parts. While some think of underarms, mine would be inner thighs. While I do not plan on wearing a bikini after, it’s for my own private issue to want to lighten the area down there. In my case, it would be the neck and the inside of the thighs, as I don’t have a thigh gap and am rather overweight. I am also thinking of the age spots on my face, as I was told that it will also lighten the spots. I just started using the Triple Whitening Soap as of this writing, but my friend who has been a regular user says that she is now more confident because her underarms, inner thighs, and buttocks now look so much lighter than before. She used to feel ashamed, as they “looked” dirty and embarrassing. She only finished one bar and she has already seen the difference. 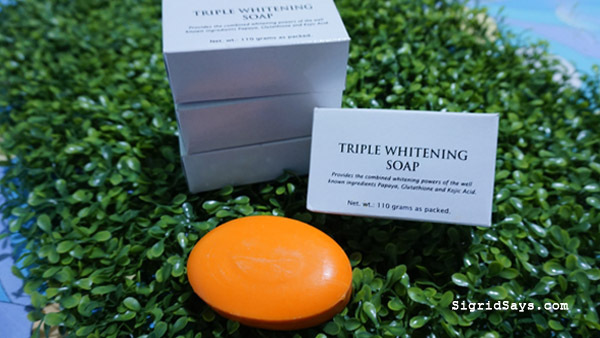 Since Triple Whitening Soap contains papaya, it may be effective in controlling existing and preventing pimples and acne. It may also be used to lighten the scars caused by these nasty zits. 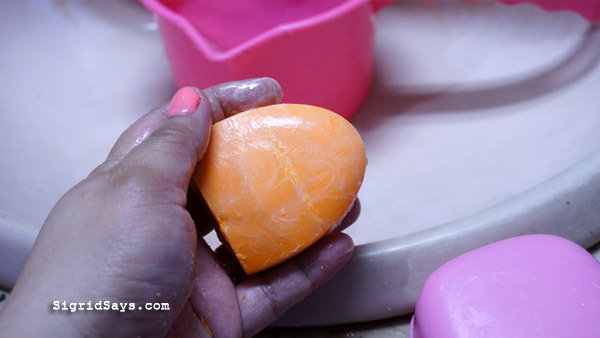 If you are just going to use the soap on the face or just some parts of the body, it is best to cut it in little pieces so that it will not be used up fast. You can just use the Triple Whitening Soap like any regular soap. 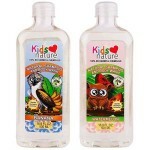 As for the face and neck, you have to lather the soap in your hands before applying the soap. The skin on the face and the neck are usually very sensitive so it is best not to let the soap be in contact with the facial skin directly. To use on the face and neck, which are sensitive areas, it is best to lather the Triple Whitening Soap on your hands first before using on the areas intended. But as for the other dark parts, the soap can be used directly on the skin. There is no need to rub so much or let the soap stay on the body for it to be effective. You just use it like you would use your regular bath soap. If you are not going to use the soap on your entire body, it would be best to slice it so that it will not get used up fast with exposure to water. But I think you need a very sharp and thin blade to cut it. Plus you need to cut it in half and not in smaller parts because when I tried to cut it in thirds, the smaller part broke. So I’m just gonna use it as it is. I sliced a third off my bar and it wasn’t very neat. The smaller part broke off. I think that with water, you can put it back together. Hopefully, this works on me so that I can update this post–maybe after a month. For those with the entrepreneurial spirit, you can sell the Triple Whitening Soap for extra income. You can sign up for a minimal membership and then get discounted products to sell. The product works and is reasonably priced, so it is easy to sell. Start a Triple Whitening Soap business and extra income! 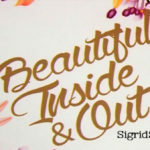 You may call or text Mobile No: (0927) 4478834 or you may send me an email at sigroid75@gmail.com. 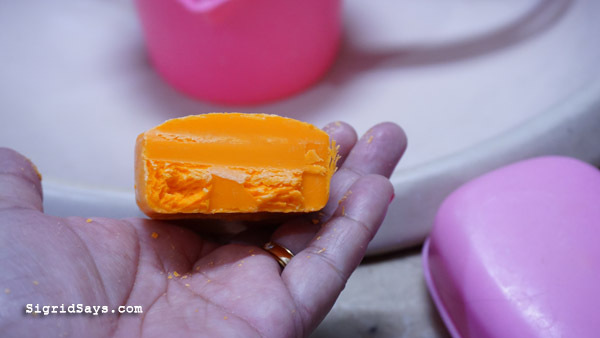 You may pick up the soaps at Wilmar Enterprises, Narra Avenue, Shopping, Bacolod City. Minimum subsequent purchase for members is 4 pcs. of Triple Whitening Soap.